The remote control for my TV recently got busted. I think it just needed some reprogramming. Yet I intentionally did not fix it as a way to discourage me from watching TV or at least switching channels to watch a show. I didn't fix it for a week. It's actually still not fixed and I'm okey with that. 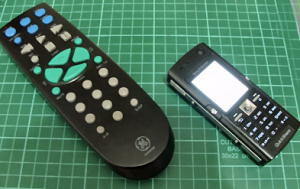 Meanwhile, I discovered a new remote control... my mobile phone. I discovered the function where my phone can control my computer via bluetooth. So I tried it one night before sleeping. I left my pc online and internet explorer set to my friendster account. I got to my bed afterwards which is around 2 meters away from my pc and tried to access my computer. I was surprised that I could move the cursor, click and navigate windows. Now when I wake up in the middle of the night, I can connect to the net, check my email and set files for download. I just can't read anything since I'm still in bed and barely awake for my brain to process anything intellectual (nor basic for that matter when your mind is still asleep). But the task is astonishing enough for me to give props to this technology.